As promised, here are the measurements and details for the projects made at my September stamp clubs and classes. 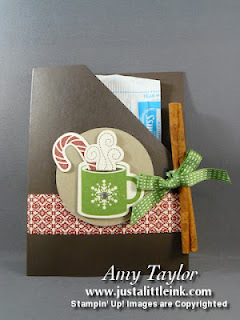 This first card was modified from a swap that I received from Barb Duran, a fellow Stampin' Up! Demonstrator. 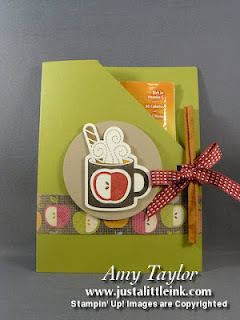 The only changes that I made to it, were to use the new Early Espresso Core-dinations card stock through the Sizzix Big-Shot using the new Woodgrain Textured Impressions Folder (#127821, $7.95). This new card stock is super cool! After it is textured, you use the Stampin' Sanding System (#129367, $3.95) and dust buddy (#129366, $2.50) to sand and expose the fibers, and then clean the dust from the surface. A few neat effect. This next card uses another neat technique called triple-time stamping. I love it because it looks so involved and yet is so simple to reproduce! Here are the measurements for the pieces of card stock needed. 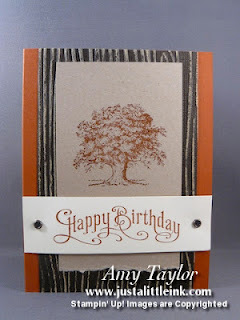 You can make this card using one full sheet of colored card stock and one full sheet of neutral card stock. Colored card stock: 5-1/2"x8-1/2" (card base), 4-1/2"x3-1/4", 3-1/2"x2-1/4"
Neutral card stock: 5-1/4"x4", 4-1/4"x3", 3-1/4"x2"
Stamp Sets: Wonderfall (#128084 [w] $24.95 or #128087 [c] $17.95) & Petite Pairs (#122495 [w] $28.95 or #122497 [c] $20.95) & En Francais (#109521 [w] $17.95). You take each of the neutral card stock pieces and layer them to one another using a temporary adhesive. You don't want to use a permanent adhesive, because you want to remove them after stamping. Then, stamp all 3 pieces, not worrying about the gaps that show in-between the layers. Remove the layers. Next, attach each layer to it's coordinating size colored card stock piece. Re-assemble, this time using permanent adhesive. Finish off with desired embellishments. Here I used some Linen Thread and a Brushed Bronze Designer Button (#127833, $6.95 pkg. of 16). This next project we did at my stamp club. I got the idea from Dawn Olchefske. It was such a great idea that I made very few changes to it. I didn't have and couldn't find any chocolate covered stirring sticks or candy canes either. Go figure that I couldn't find candy canes in September, but oh well. I came up with the idea of using cinnamon sticks instead. The other changes I made was to use Gumball Green 3/8" Stitched Satin ribbon (#126848, $8.95) for tying the cinnamon stick onto the pouch, and the use of the Festival of Prints designer series paper stack (#126904, $6.95). The pouch is made using a half sheet of card stock, 8-1/2"x5-1/2", scoring it in half at 4-1/4" and then on the diagonal (using the Simply Scored tool and the Diagonal Scoring Plate) at 5-3/4". Here's the pouch we made at my stamp class in September. Because I was focusing on Fall projects, I wanted the pouch to be fall inspired as well. Here, instead of using a cocoa pouch, I used a spiced apple cider pouch. The same supplies as listed above were used, in addition to using Perfectly Preserved (#126690 [w] $28.95 or #126692 [c] $20.95) and the Cannery Set Framelits (#127822, $24.95). These 2 items are also available in a bundle (#129943 [w] $44.95 or #129944 [c] $38.95). The card stock color is Lucky Limeade and the designer series paper used was Orchard Harvest (#126895, $10.95). The candle here was stamped using the En Francais (#109521 [w] $17.95) and Jet Black Staz--On ink. 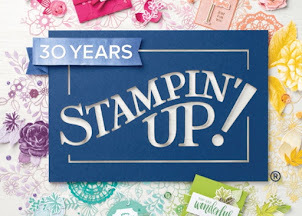 This project was demonstrated by Shannon West at Stampin' Up! 's Annual Convention this July. 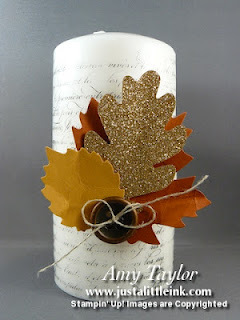 I wasn't a big fan of the stamping as it is difficult to get it to look the same all the way around the candle. If you like the vintage look, then you might like it. The leaves are done using the coordinating Die for the Sizzix Big-Shot, Autumn Accents (#127812, $21.95). The accent piece was very simple, cut leaves from different colors of card stock, here More Mustard, Cajun Craze & Champagne Glimmer paper. Attach all with the glue gun and our new Silicone Craft Sheet (#127853, $5.95) onto a 10" strip of 7/8" Natural Cotton Ribbon (#127844, $7.95). Attach a Brushed Bronze button and Linen Thread (see above), again with the glue gun. Wrap it around the candle (one side of ribbon is still un-attached) and attach loose end to the candle, again with the glue gun.